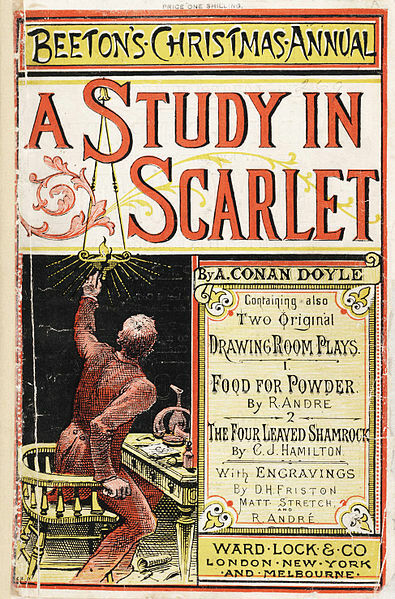 Arthur Conan Doyle published the first Sherlock Holmes novel “A Study in Scarlet” in 1887, seven years after the end of the Second Anglo-Afghan War. These were the final years of the English empire in its sprawling prime. Yet while English conscience shifted away from colonization following the costly war, fashion and fascination was still for the exotic finery of the Empire’s furthest reaches. Arthur Conan Doyle did not create the crime novel, although he is often credited with its popularization. Much to the author’s chagrin. Doyle much preferred his historical novels, from which the popular and much-demanded Holmes stories forced his attention. Although Sherlock Holmes was paying the bills, just four years after the publication of the first book, Doyle wrote to his mother saying: “I think of slaying Holmes… and winding him up for good and all. He takes my mind from better things.” His mother advised emphatically against it, and for a number of years Doyle was put off, but his resentment for the detective only grew. In 1893 Doyle finally took the plunge. He killed Sherlock Holmes. Public outcry was incredible. Readers all over the world wrote to the local publishers of the books to demand a revision, a solution, a survival. Doyle remained unswayed by the fervency but mounting monetary obligations forced his hand and, in 1901, he published one of the best known Sherlock Holmes stories: “Hound of the Baskervilles” which was set before Holmes’ death. Doyle finally brought Holmes back to life in 1903, but grudgingly and again for primarily financial reasons. 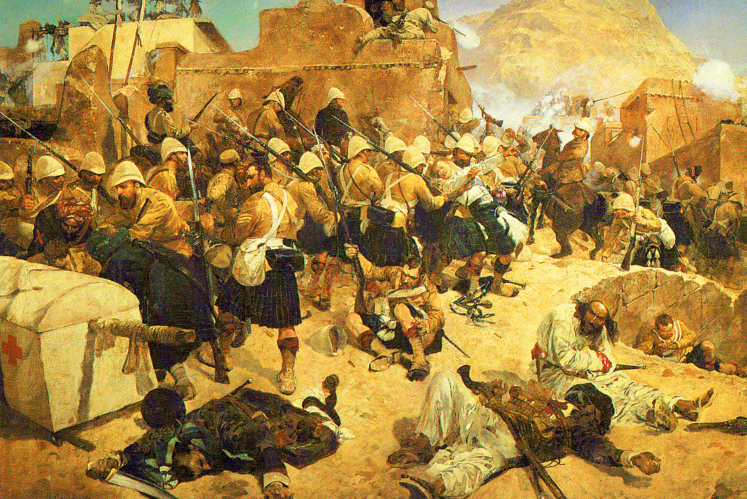 92nd Highlanders at Kandahar by Richard Caton Woodville. The piece and color palette that I assembled do not feature deerstalker caps, meerschaum pipes, or magnifying glasses. My intention instead was to create something based on both the time period’s brutal colonialism and the rooms of 221B Baker Street itself as seen in the Sherlock Holmes Museum in London. I was heavily inspired by my attendance to the first annual 221B Con, a Sherlock Holmes fan convention held in Atlanta. While there I had the pleasure of listening to a visiting author and historian speak about the importance of Dr. Watson’s professional history, the Second Anglo-Afghan War, the Battle of Maiwand, and the context in which a contemporary reader of the Holmes stories would have viewed his character. I used two pieces of braided cotton cord, folded in half and knotted around a link in a large chain. 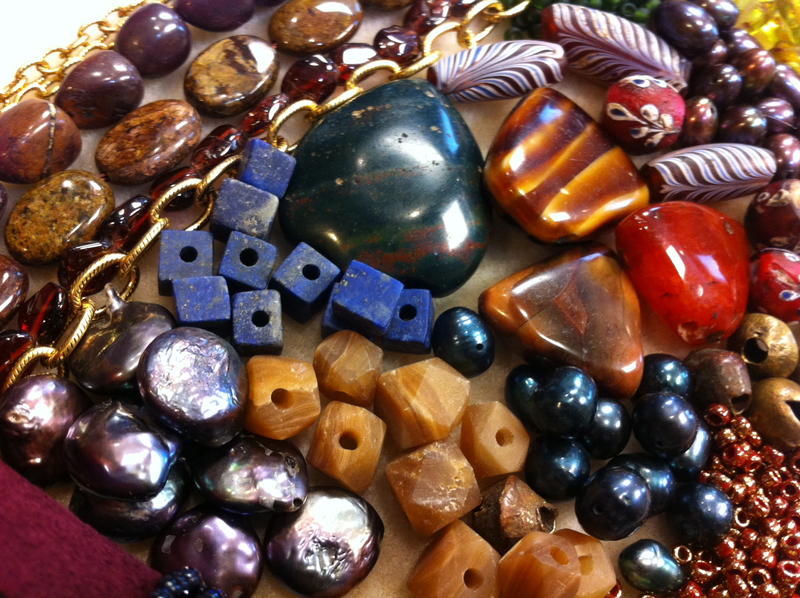 The ends I glued into a gold-plated kumihimo end. The chain that I chose has links that open, which made it much less frustrating to attach all of those wrapped loop charms — it never fails, does it? The moment you let your guard down, you’ve finished that lovely wrapped loop and, oh no, you forgot to actually attach it! If you’re going to be using a chain with soldered links, remain vigilant. 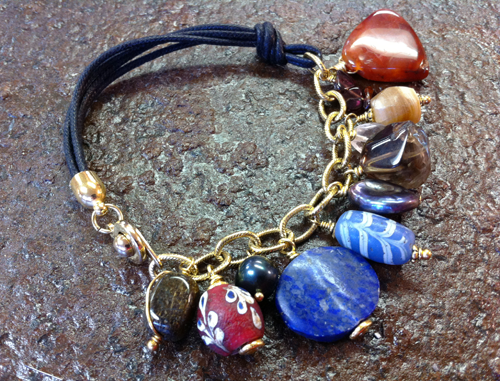 And pay attention to which side of the links your charms are going on. 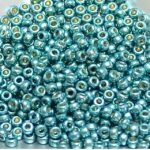 Ideally you will want to place them on the same side of every link, which will make it all lay very nicely when you wear it.